innovationhongkong® was pleased to be a partner of Finovate Asia 2018 held at the Hong Kong Convention & Exhibtion Centre October 29-30. As a partner, Innovation Hong Kong was able to offer a special VIP discount of 20% to attend. Lots of demos, panel sessions and insights over the two days – please refer to the coverage in the Business & Financial Services section of this website for more. 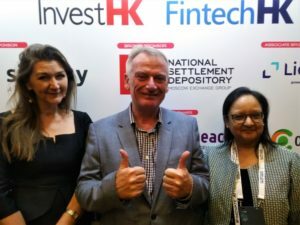 Katie, senior conference organiser Finovate, Chris Skinner, Chairman Financial Services Club & Bina Gupta, Innovation Hong Kong.